In late May, Patty Mark was shockingly arrested for her act of compassion. Mark's problem is that the animals she rescued were not the dogs and cats we hold dear in Western culture - as in the case of an Army veteran in Georgia who smashed out the windows of a hot car to rescue a dog trapped inside, and who recently had charges against him dropped - but, rather, hens at an egg farm. For taking the abused animals to a vet, she is now facing serious charges that could land her in prison. The stories being told from such investigations and rescues are having an impact. In May, Gallup released a poll indicating that an astonishing 32 percent of Americans - up from one in four in a 2008 poll - believe that animals should have "the same rights as people." When Patty Mark, an unassuming 66-year-old grandmother in Melbourne, got wind of appalling animal abuse happening right next door, she did what every caring grandmother would do: She helped the animals in need. Some were starved. Others had been mutilated. One was so infected with pus that she lost half her body weight when the diseased liquid was drained out of her belly. 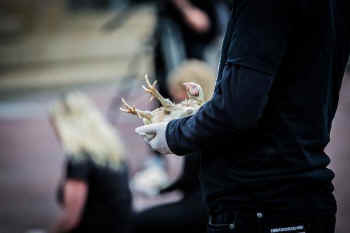 Mark documented the nightmarish abuse and brought a small handful of near-death hens to a veterinarian for emergency care. In late May, Mark was shockingly arrested for her act of compassion. Mark's problem is that the animals she rescued were not the dogs and cats we hold dear in Western culture - as in the case of an Army veteran in Georgia who smashed out the windows of a hot car to rescue a dog trapped inside, and who recently had charges against him dropped - but, rather, hens at an egg farm. For taking the abused animals to a vet, she is now facing serious charges that could land her in prison. I have a special interest in Mark's case. For 10 years now, I, too, have left the safety and comfort of my day job (most recently, as a corporate lawyer) to walk behind the closed doors of animal agricultural facilities. I, too, have been horrified by what I saw on the other side. Every farm I have visited - factory farm or family farm, battery cage or free range - has been filled with violence that would shock the conscience of ordinary people. And, I, too, have rescued a handful of the most desperate victims. In January, I and a handful of other investigators with the grassroots animal liberation network Direct Action Everywhere released footage of what we found when we visited a "Certified Humane" Whole Foods egg supplier. During the investigation, we, like Mark, rescued a hen who was near death, and who we named Mei Hua ("beautiful flower") and nursed back to health. The stories being told from such investigations and rescues are having an impact. In May, Gallup released a poll indicating that an astonishing 32 percent of Americans - up from one in four in a 2008 poll - believe that animals should have "the same rights as people." Influential voices across the world are recognizing and rejecting the violence we perpetrate on animals, with a New York Times columnist noting that we have moved passed the era of animal welfare and entered "what might be called [an era of] animal dignity." The tide, in short, is turning. That is why Mark's case is so important to industries that profit from violence against animals. With public sentiment shifting against them, these industries must fight back. They know they cannot win in the court of public opinion, so they are fighting in the court of law, where lobbyists and lawyers give these industries an unfair advantage. And with increasing prosecution of nonviolent activism, and so-called ag-gag laws spreading across the world (most recently, Mark's own Australia), industry just might succeed. If investigators such as Mark - or me - are sent to prison for documenting and remediating abuse of animals, the investigations will stop. And the loser will be public dialogue, corporate accountability and, most importantly, the animals that are the victims of this violence. But there is another path forward. If the public comes out strongly in favor of work such as Mark's (and her groundbreaking organization Animal Liberation Victoria), and against attempts by industry to silence whistleblowers and dissent, the investigations and rescues will continue. And what those investigations will show is not just isolated acts of cruelty, nor individual acts of compassion. In the face of dark and terrifying violence, rescues such as Mark's light the path to a different and better world, a world where the animals of this earth are treated not as objects or machines, but as the living, breathing and feeling beings they are.